As from 1 January 2010, new trucks sold in South Africa will have to comply with Euro II emission standards. According to the Euro II regulations, engines can’t produce more than 2.2 grams per kilometre of carbon monoxide and 0.50 g/ km of hydro carbons and nitrous oxides. Through its environmental policy, Nissan Diesel aims to create a better environment by taking every possible measure to tackle global environmental issues. The company aims to develop environmentally friendly products through measures such as reducing exhaust emissions, improving fuel efficiency, developing cleaner fuels and reducing external automobile noise. With the introduction of the Quon on the global stage, Nissan Diesel made a strong statement of its intentions to become an even bigger and more environmentally caring truck maker in the future. 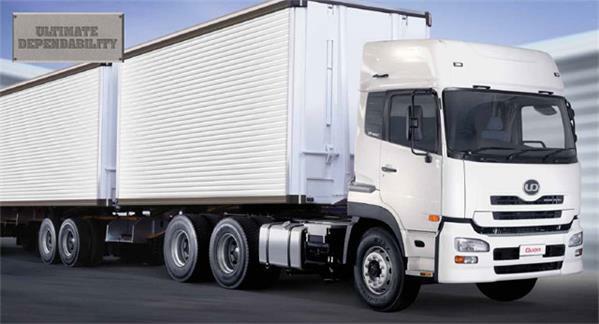 The Quon was the first truck in the world to conform to the very stringent long-term emission requirements in Japan. In fact it already complied in 2005, which was a year prior to the imposition of these regulations that are even stiffer than Euro 5. Under the provisions of the Kyoto Protocol, which became effective in February 2005, Japan has promised to lower greenhouse gas emissions relative to fiscal 1990 levels by 6% no later than 2010. In addition, the Kyoto Protocol Target Achievement Plan was established in April 2005 to provide a blueprint for many initiatives aimed at achieving this goal. According to this plan, one goal is a 55 million ton reduction in transportation CO2 emissions between now and 2010. This would result in emissions that are expected to be 15.1% lower in 2010 compared to those recorded back in 1990. Nissan Diesel implements the three ‘R” system – Reduce, Reuse and Recycle – and examines the environmental impact of trucks across the entire lifecycle, from development and design to disposal and recycling. Nissan Diesel takes care to use resources effectively and minimise environmental impact at every stage. End-of-life trucks are a source of used parts, materials for recycling and other items that can be reused. However, some materials must still be discarded and Nissan Diesel is working with other automobile manufacturers to seek more ways of disposing and recycling these materials so that resources can be used more effectively. Nissan Diesel Japan also has a Voluntary Action Plan for Recycling, which comprises two core elements. First is the achievement of a recycling rate of at least 90% for all newly developed models that started in 2002. Second, is the establishment of targets to reduce and eliminate environmental impacting substances in new models. The company plans to raise the recycling rate to at least 95% by using even more recycling technologies. Regarding environmental impacting substances, Nissan Diesel eventually aims to completely eliminate the use of mercury, cadmium and hexavalent chromium, as well as reduce the use of lead in manufacturing. Nissan Diesel participates in community activities in many ways, including assistance in dealing with the aftermath of natural disasters and participation in volunteer programmes. The company has a long-standing commitment to encouraging employees to volunteer for community activities. Japan is already considering the establishment of standards that are even tighter than the new Long-Term Diesel Emissions Regulations. These restrictions are likely to cut permissible engine exhaust levels to about one third of its current standards. Not satisfied with merely reducing nitrogen oxides and particulate matter released by diesel engines, Nissan Diesel took its technology several steps further. The company incorporated FLENDS technology in its Quon heavy-duty trucks, demonstrating their commitment to progress on a global scale, regarding environmental issues and the needs of the logistics industry. Modified to run on compressed natural gas, the FLENDS system cuts CO2 emissions by one-fourth compared to current-generation CNG engines. The use of urea makes it possible to reduce emissions of particulates and NOx concurrently, as urea acts as a NOx-reduction additive. FLENDS is just one of many R&D projects at Nissan Diesel that are aimed at reducing fuel consumption. One example of a technique already in use is cabins and bodies that are specifically designed to minimise air resistance. In South Africa, the Quon UD 460 KT, for instance, further enhances fuel efficiency by using the ESCOT-At IV, a 12-speed automatic transmission, which simplifies vehicle operation while improving fuel efficiency. For fuel-efficient truck operation, Nissan Diesel Japan also offers the “NENPIOH” system to customers. Based on evaluations of vehicle operations, the system provides specific fuel-saving advice on a real-time basis. At Nissan Diesel, it is believed that this system can lower fuel consumption by at least 5% to 25%. Prevention of global warming is always a major theme for Nissan Diesel in research and development to maximise the fuel efficiency of the whole vehicle. The company regards the development of vehicles that use alternative energy sources as an important means of protecting the environment and conserving resources. For this reason, Nissan Diesel created a hybrid truck equipped with a diesel engine, an electric motor and a capacitor – the world’s first commercialisation of a hybrid vehicle using a capacitor. Unlike many other hybrid-electric vehicles coming on to the market, Nissan Diesel aims to employ a unique capacitor technology that avoids the very high cost of replacing batteries. The so-called “SuperPower” capacitor is expected to provide service for 600 000 kilometres over a 10-year period without replacement, unlike lead-acid batteries that would have to be swapped out at least three times over the same period. Nissan Diesel South Africa will continually invest in making trucks that not only suit our customers’ requirements, but also don’t add to the already burdened environment. The company will also take various actions to reduce the volume of waste produced and will, during the course of 2009, implement training and education programmes, so as to keep both employees and management informed with regards to environmental policies and matters.